We have partnered with Kuvée Facial Bar to bring to you the best of skin care. HydraFacial MD™ Skin Health For Life™ The HydraFacial MD™ procedure cares for your skin, it’s 4 in 1 Step vortex fusion serum delivery system that cleanses, exfoliates and extracts to remove impurities and dead skin cell while replenishing vital nutrients including Antioxidants, Peptides and Hyaluronic Acid. These performing ingredients help mitigate environmental damage, reduce the appearance of fine lines & wrinkles, plump and firm skin for long-term results you can see and feel instantly. 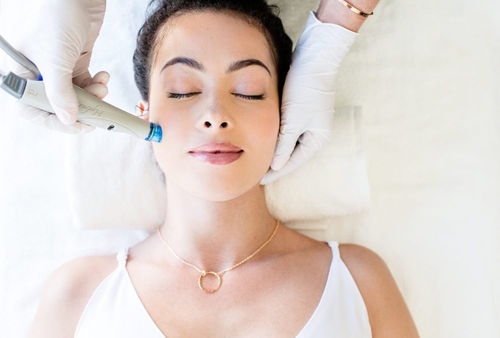 cleansing, exfoliation, extraction, and hydration all while HydraFacial is a non-invasive, non-surgical procedure that delivers instant results with no discomfort or downtime. The procedure is soothing, moisturizing, non-irritating, immediately effective, and also fast. 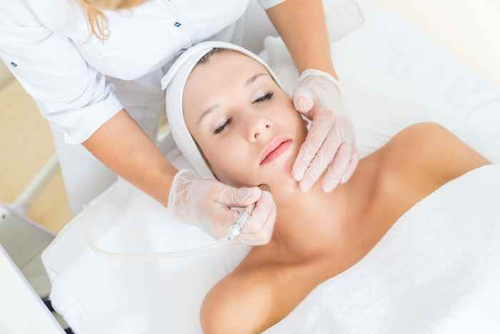 The HydraFacial ™ improves the quality of your skin, making it healthy. Giving you “The HydraFacial Glow”. The HydraFacial ™ serums specifically target your skin issues including sun damage, blackheads and whiteheads, enlarged pores, acne, brown spots, uneven skin tone, and early aging fine lines and wrinkles. HydraFacial™ LED Light Therapy mode provides additional benefits post HydraFacial™ treatment. The red LED light is used to improve the appearance of skin firmness and resilience. It also helps reduce the appearance of fine lines and wrinkles, hyperpigmentation, and other signs of aging. The blue LED light is extremely beneficial for people who suffer from oily skin or breakouts. The lymphatic system is a network of tissues and organs that help rid the body of toxins & other unwanted materials. The function of the lymphatic system is to transport lymph, a fluid containing infection-fighting white blood cells, throughout the body. It's responsible for excreting molecules that accumulate in our body tissues. We can eliminate many toxins from the body & move fluid out of your tissues into lymph nodes where bacteria, viruses & other harmful microorganisms are destroyed. We offer a variety of different customizable specialty facials to best suit your skin type. Most popular: soft green tea mask, sensitive skin shooter facial, ice globe facial, ultimate anti-aging facial, anti-aging golden soft mask, anti-pigment brightener facial.